Marc Jacobs will launch a follow-up to his popular perfume, Blush. 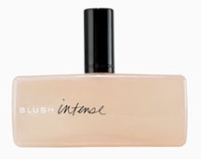 Look for Blush Intense in early spring, with jasmine blossoms, jasmine nectar, jasmine vine, intensified Moroccan jasmine, orange flower, genet absolute, pine musk, cashmere white woods and creamy sandalwood. Marc Jacobs Blush Intense is an Eau de Parfum, and will be in 50 and 100 ml. Splash 1, with freshly snapped snow peas, musks, soft woods and muguet. Splash 2, with clementine zest, Tropical rain accord, beech amber and musk. Splash 3, with liquid oxygen, dewy greens, crisp citrus, Marc T Accord, cotton flower, woven musk, sandalwood, and blonde woods. (via escentual.co.uk, with thanks to Marina for the link) Update: see more information on the Marc Jacobs Summer Splash scents here. For the scent's inspiration, Hermès in-house perfumer Jean-Claude Ellena turned to the writings of French author Jean Giono. "He is a man who loves the richness of nature," said Ellena, who decided to create a vertical fragrance containing primarily vegetal and mineral notes. No musk notes are included. "Musk creates a mask on the skin," he explained, adding that without such a note, a person's scent is evident. "So each time, the fragrance is unique." (via Women's Wear Daily) You can see the notes for the fragrance here, or read my review of Terre d'Hermes. “A vertical fragrance”, huh? that reminds me of a Friends episode, in which Joey auditions for Jeff Goldblum's play. Goldblum says his performance is too horizintal and tells him to be “more vertical”. Splash No 3 has Something M Will Never Wear written all over it. Liquid Oxygen, yikes! I am there for the Terre d'Hermes. Totally. But what, pray tell, is Marc T accord??? I love Jean Giono's writing – can't wait to sniff the olfactory rendition! T, I had to google him, so obviously haven't read any of his works. Which is your favorite of his books? You must read le Hussard sur le Toit and Provence – that will give you a good idea of his writing. Angelo is good too. Sorry it took so long for me to reply to this, just found it again when looking at the Terre d'Hermes comments today. Blush was a nice enough casual jasmine — but MJ has clearly hit his stride in terms of packaging & promotion — the scent can be “nice enough” but if the packaging is also just “nice enough”, you won’t make a gajillion dollars as he has with Daisy & Lola.